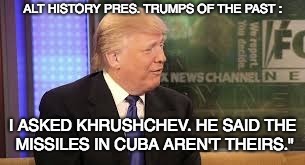 Can you imagine Comrade Trump standing up to Russian Premier Nikita Khrushchev in 1962 and blockading Cuba when they were placing their atomic missiles 90 miles from us? Me neither. In fact, he would have said it was fine, as long as he could erect Trump Towers all over Russia. Can you imagine The Diaper Don taking on the Mafia when they were on the verge of attaining a controlling influence on nearly every aspect of our lives? Me neither. He'd be partnering with the mob to build casinos, in more places than just Atlantic City. Can you imagine Cadet Bone Spurs commanding PT-109? A war hero? Risking his own life to save his men in ocean waters coated with burning oil on the surface and man-eating sharks below? No way, he would have been insisting they carry him to safety and then insist they pay him for the privilege. Once on dry land; instead of then swimming out to sea again to seek help like JFK did, Trump would have started whining that there was no KFC in sight and he would have called the region's pro-American indigenous people rapists. There are 3 places on earth that trump could even dream of being elected. One is Russia, but they already have a very competent version of trump. Another is the Philippines, but they have their own version. The only other one is the usa. it says sooooo much more about this shithole than it does about him. Yet nobody seems to be able to see that. 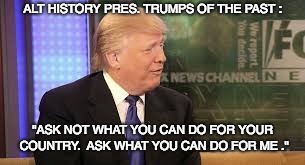 Which also says soooooo much about this shithole. Basically this is a colossal shithole full of colossal dumbfucktards with pretty much zero hope for any improvement short of a civil war. makes one wish for a merciful gawd... since that's our only hope.